The «Boris Sokolov» is built in China, has Greek owners and will serve Russia’s grand Yamal LNG project on the coast of the Arctic Ocean. The icebreaking tanker officially got its name in a ceremony in Guangzhou, China, on 4th December and subsequently started preparations for its maiden voyage through Arctic waters. It is the Guangzhou Shipyard International that has built the top ice-class Arc7 carrier. It is handed over to its owner, Greek company Dynacom Tankers Management, more than a year after the original time schedule. 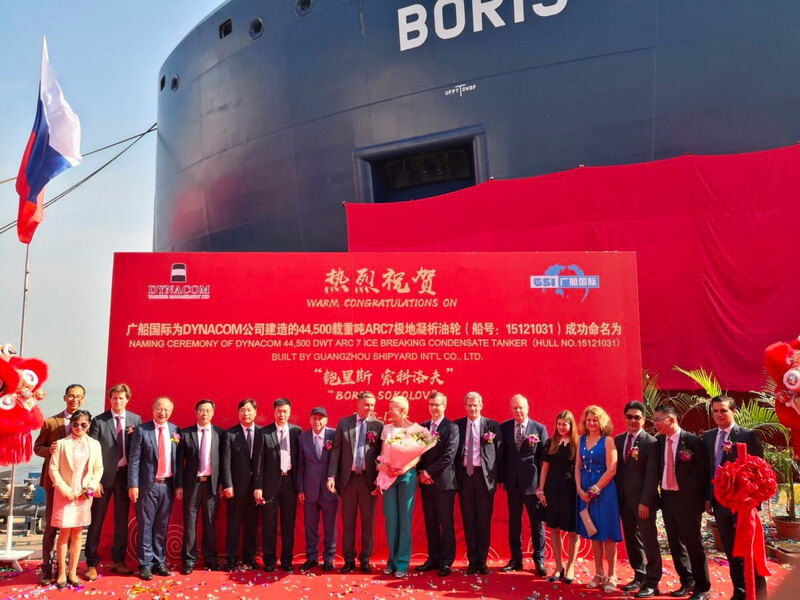 Representatives of the yard, Dynagas and Russian natural gas company Novatek assembled on the Guangzhou waterfront to celebrate the newbuilding. Among the prominent guests was Yuliya Zobova, the Novatek representatives who is the ship’s godmother. The tanker is designed by AkerArctic, the Finnish company that has been instrumental in designing also the natural gas carriers for Novatek’s Yamal LNG project, Gazprom Neft’s Prirazlomnaya tankers and several more Arctic ships. «There are not many tankers in the world with an ice class this high,» senior company designer Mauri Lindholm said about the new ship. The reference vessels for the new design are the two 70,000 tdw tankers for the Prirazlomnaya project, designed for Sovcomflot about ten years ago, he explains in a description of the ship. The «Boris Sokolov» will shuttle to and from Sabetta, the new terminal in Yamal Peninsula, and ports in Europe and Asia. The ship is primarily built for condensate deliveries but can later be applied also as a regular oil tanker, AkerArctic says. It is 214 meter long and has a deadweight of 43,300 tons. It is able to autonomously break though 1,8 meter thick ice. Gas condensate is a byproduct of fine oil separated from the natural gas before its liquefaction process. It is a low-density mix of light oils and is a valuable raw material for the petrochemical industry or as fuel. The resource base for Yamal LNG project is the South Tambey field, which holds more than 900 billion cubic meters of natural gas. The field also includes 30 million tons of liquid hydrocarbons. The first shipment of condensate from Sabetta took place in late January 2018, only few weeks after the project was launched.